Marking an important mid-term milestone, the EJOLT project has chosen Italy, an emblematic country for its environmental conflicts known worldwide, as the next location of the annual meeting. 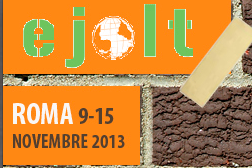 EJOLT partner CDCA—Documentation Centre on Environmental Conflicts—based in Rome, is organizing a series of activities from the 9th to the 15th of November that will gather the up-to-date project outcomes and offer the Italian and international audience a window into the debates that animate the EJOLT network. This programme will last a full week and will consist of many interest events. First is the project delegation, which will lead to the very heart of Italian environmental conflicts with a two-day “toxic tour” called “Biocidio Tour,” followed by journalists and experts that will visit two areas well-known for their levels of contamination and severe impacts on health. On the delegation’s first day, it will meet the communities of two critical areas of the Roman suburb: the biggest urban waste dumpsite of Malagrotta and the Sacco Valley, which is one among many areas under study by the Italian Superior Health Institute (Instituto Superiore della Sanita) to demonstrate the relationship between environmental contamination and health impacts. Next, the tour will visit the “Fires land”—Terra dei Fuochi—in the Naples area that is well-known for the waste-related contamination disaster that today sees new mobilisations against the construction of a new incinerator to burn “ecoballs” (see CEECEC project report on Campania waste crisis here) . Hosted by the Urban Center in the Garbatella neighbourhood, project partners will then have the opportunity to exchange and enhance their knowledge and competencies through four days of internal workshops on fundamental tools to support the work of Environmental Justice Organisations (EJOs): methods of evaluation and legal strategies lead by the Universitat autonoma de Barcelona, the Université de Versailles, Universitat Rovira I Virgili and CDCA. EJOLT events will have the participation of Pablo Fajardo, the lead lawyer in Chevron-Texaco suit (among the most important of legal battles worldwide against oil companies for environmental destruction that resulted in the company being sentenced to a fine of 19 billion dollars, as reviewed in the last EJOLT report “Digging deep corporate liability. Environmental justice strategies in the world of oil”). Pablo Fajardo, among other guests and distinguished EJOLT experts and activists, will bring forward their experience to the cultural public event “Stop Biocide. Environmental Justice in the world” to participate in a public debate on the right to health and the protection of communities. Finally, the EJOLT Italian experience will conclude with the international conference “A geography of environmental injustices. Knowledge, experience and tools for local communities” that will socialise and present a vision of EJOLT contributions in terms of good practices of fruitful collaboration between environmental justice organisations and the academy. NEW !! The programme is now available online !